If you’re into the interior design business, but you still lack the experience, you can start with smaller DIY projects. Decorating your fish tank is fun and rewarding at the same time because you have the opportunity to express your personality while creating the most welcoming and relaxing environment for your swimming pets. Whether you choose a large aquarium or a simple bowl, the only limitation you have is your budget. Don’t forget that some decors and lighting systems may end up costing a fortune, so you may have to use your imagination more. If you want to make sure your fish live a long and happy life, here are some handy tips you should follow. The easiest way to add your personal touch to an aquarium is picking a theme and sticking to it. 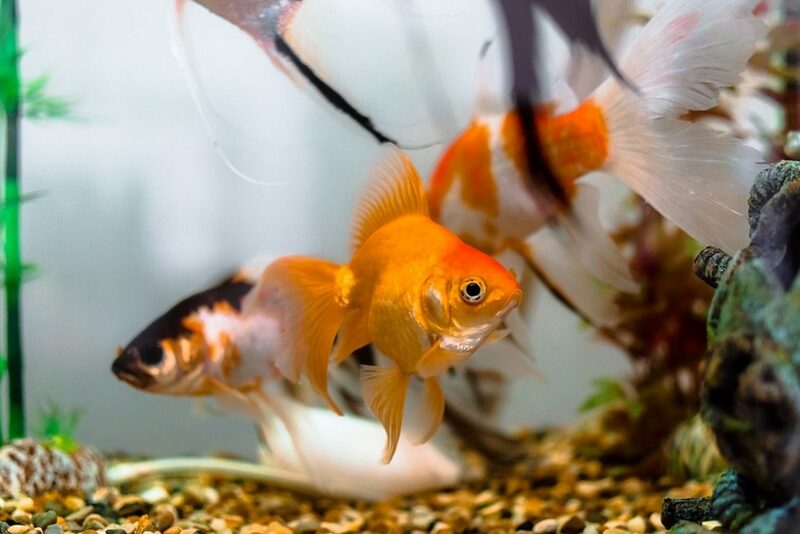 Whether we’re talking about pirates and lost treasures, an exotic paradise or even a fairytale with aquatic knights and castles, your fish tank must tell a story. Choose items that fit together and are from the same theme universe to create a unique and safe space for your fish. 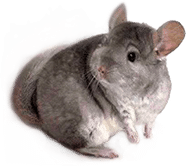 You can check some online guides for inspiration or hit the local pet stores to search for decor. Remember that everything you put inside the fish tank should be suitable for these creatures. Therefore, stay away from toxic items or small pieces that can be ingested by your pets and lead to serious health problems or even death. Stone, wood, and natural plants represent the perfect choices. Pebbles and rocks also make for ideal hiding spots and camouflage for the shy inhabitants of your tank. On the other hand, unless you accommodate fish in high pH water, you should avoid using coral skeletons, real shells or limestone as these elements will slowly dissolve in the water, increasing its pH hardness. After you decided on a theme, it is high time you started building your oasis of relaxation. Begin by choosing the right background and type of floor for the fishbowl. A suitable background is mandatory for your fish to feel safer and more relaxed, so stick to high-quality images of the sea world or pick something in calming shades of sand, yellow, green or aquamarine. You should probably avoid aquarium backgrounds that are dark as they will make your tank look smaller and can also easily hide some fish. As for the floor, you can either choose a complementary tone or one close to the shade of your background for a calmer effect. 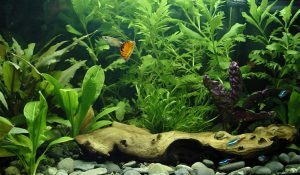 A colorful or even a rainbow floor is suitable when you keep the rest of the tank decors clean and simple, without too many elements. Another way to achieve a bright decor is to purchase items of various sizes. Put the larger plants and decorations at the back or on the sides of the tank to create the illusion of space and height, even in smaller fish tanks. Add all smaller decors in the front so you can have a clear picture of what your fish are up to every moment of the day. You can choose the larger or taller decors to hide heaters, airlines or lift tubes and create the impression of a seamless design. The key to a beautiful aquarium is making it as simple and welcoming as possible for its inhabitants. That being said, avoid adding too many elements that could make it look overcrowded. You should focus on a central piece of decor such as a castle, a waterwheel, a volcano or any other larger element and try to bring it into prominence. Make all the other decorations smaller and place them in the background while leaving enough free space for your fish to swim freely. Don’t overcrowd the tank with too many water plants or natural elements either. Keep in mind that simpler is always better. Contrary to the common opinion, natural water plants are not a necessity in your aquarium. On the contrary, they require special lighting and water temperature conditions to grow so, unless you want to look after them as well, you should stick to artificial plants. High-quality plastic plants can look and feel as real as their natural counterparts but won’t require special care. In fact, the industry of artificial tank decors is thriving today, providing thousands of products that look as real as wood, stone, coral skeletons, logs or plants with the only difference that they will last longer. So why invest extra time and money in the “real deal” when the artificial ones look the same? Learning how to pair colors is extremely important because fish are sensitive and can easily become stressed in unwelcoming environments. Our suggestion is to stick to maximum three-four colors to allow your fish to stand out from the crowd. 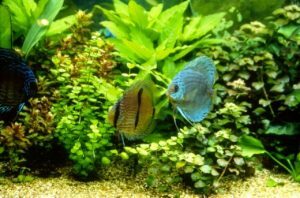 Picking decors of various shades will only make it harder for you to spot your aquarium inhabitants and notice any potential threats or signs of health problems. Keep in mind that fish require a welcoming and calming environment, so pick shades close to what they would find in natural habitats. Stick to green and brown and don’t add more than one or two elements in vibrant colors such as red or orange. Purple is tiring for your eyes and your fish, especially if it’s combined with other strong colors. When it comes to decorating aquariums, the idea is to create the perfect balance between style and functionality. So, instead of going for large and flashy decors, you can choose some shells or pebbles of various sizes, shapes, and colors to make the tank look more vivid while allowing plenty of space for swimming.